shocking.... no this is where we are in the UK in 2019.... i am past being shocked. we are now it a state of total shut down and you are no longer allowed to express any "thoughts" if it might offend someone. Is there anyone stupid enough to believe that if he used that language he wouldn't have been contacted by the police or arrested? It would have been all over the media. But where is the evidence? where are the screenshots ... there are none because it didn't happen. But you are being spun a line. funnily enough he is tommy talking about muslims at the infamous leeds court arrest. it makes interesting listening. people make up your own mind what is going on. beyond belief... the police are struggling to control the violence on our streets but they have time for this nonsense. 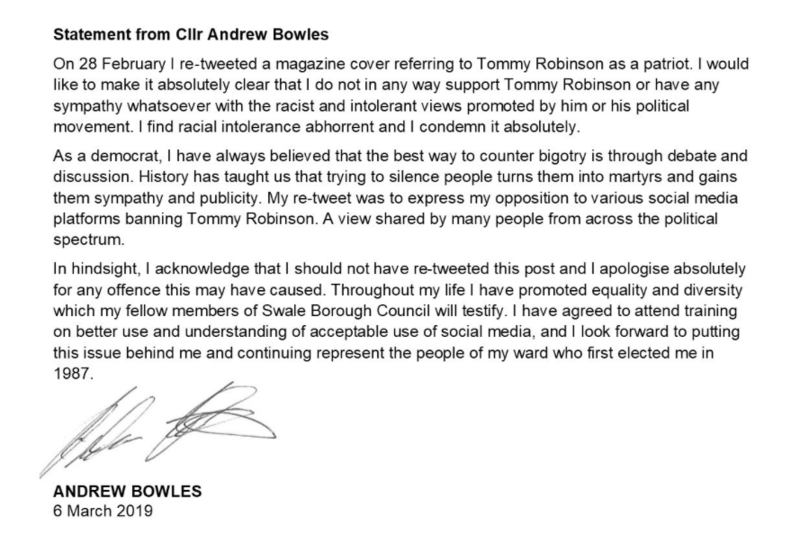 look at this spineless individual, Andrew Bowles the Swale Council Leader. You did nothing wrong. Have @Conservatives party joined in the liberal lefties witch hunt against those who speak the truth? Let's be clear Tommy Robinson does NOT preach hate but strangely enough our establishment don't stop the likes of this!!! Appeasement and cowardice, oh for some principled politicians with mettle! Should have stuck to your guns, old chap. Don't let the lefty PC bullies win. There's huge support for Tommy Robinson in your borough - they have Oh Tommy Tommy singalongs in the pubs on Sheppey. YouTube decides to keep Tommy Robinson on the platform after UKIP Leader @GerardBattenMEP wrote to Google CEO @sundarpichai asking him to ignore @tom_watson’s request to ban Robinson. Grow a pair mate, otherwise where will this end. Had respect for you yesterday. Absolutely none now. As a politician you should speak your mind. Tommy Robinson has more integrity than the majority of politicians. Thought you had until today. Sounds a bit like when I was asked to attend a diversity course because I argued with my employers when wanting a 6 week holiday, some were allowed 6 weeks off for religious reasons, I was denied as was only wanting to visit relatives in NZ. Apologise for doing nothing wrong, genuflect before the SJWs and offer yourself up for re-education. This used to be the preserve of the fascist socialists. Now the Fake Tories do it too. Time for the legacy parties to be removed. Roll on the next election.